At The Grass People we recommend feeding your lawn at least twice per year, once during the spring or summer and again during autumn. This easy to follow, step by step guide will bring your lawns vigour and colour back for Spring/Summer 2018. We all want a green and healthy lawn however it can be a battle as grass has different nutritional needs throughout the year. To feed the lawn these nutrients we apply fertilisers which are a combination of chemicals. The chemicals generally found in fertilisers are nitrogen, phosphate and potassium, known as N,P,K. The N.P.K numbers contained in fertilisers can be found on the label. With winter fertilisers, phosphate and potassium are at increased levels as these elements will encourage the growth of roots and strengthen the lawn under the soil. In spring and summer however we want grass to flourish so higher levels of nitrogen are included which will promote growth. This of fertilisers as a balanced smoothie for your grass. In preparation for fertilising, cut your grass 3-4 days before you apply the feed. 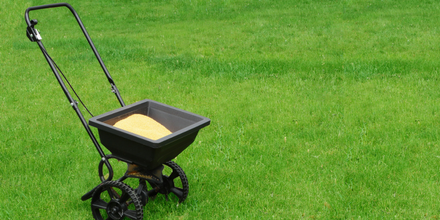 Fertilisers are best applied through a spreader to get even coverage throughout the lawn. Check the application rate of the fertiliser and set the spreader accordingly. If applying by hand, mark out 1 metre squared, fill a container with the volume of fertiliser required and apply evenly. Then repeat this action throughout the garden. In Spring and Summer is it advisable to apply fertiliser in cooler, overcast days particularly in the mornings when dew leaves the grass moist. It is also helpful to fertilise when there is rain forecast as this will break down the granules and start the fertilising process in the soil. Users should avoid spreading fertiliser on very warms days. This is because the heat can cause the fertiliser to burn the grass blades. In spring or summer there are two fertilisers which The Grass People offer; Quick Release: Spring/Summer Fertiliser or Slow Release: Spring/Summer Fertiliser. View our range of fertilisers here.